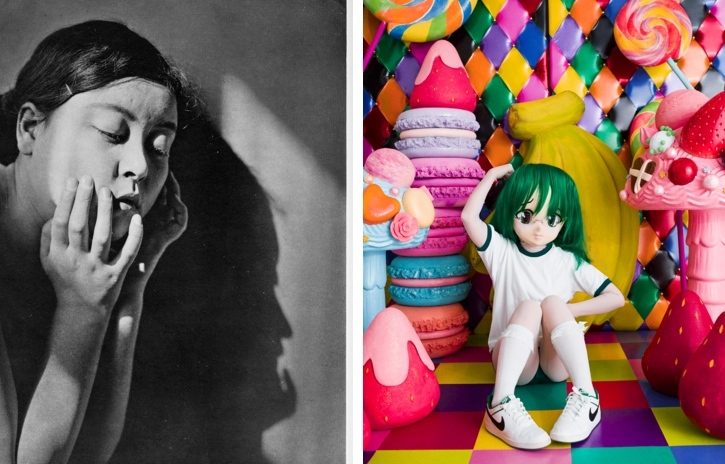 “Woman” (1932) by Yasuzo Nojima; “Tokyo Innocence” (2015) by Mika Ninagawa. “Tokyo Before/After” will be on view at the Japan Foundation Los Angeles, 5700 Wilshire Blvd., Suite 100, Los Angeles, from Aug. 30 to Sept. 29. This exhibition features a selection of approximately 80 works juxtaposing images of Tokyo in the 1930s-40s with those taken after 2010. Before World War II, the current framework of Tokyo had begun to take form, and photographers effectively utilized highly developing means of photographic expression to establish vibrant images of urban space where tradition and modernity contended with one another. On the other hand, Tokyo since the 2010s, while taking it upon itself to confront and address the fluidizing social circumstances after the Great East Japan Earthquake, is further undergoing a significant transformation towards the 2020 Olympic Games. Photographers are also trying to emphasize their individual perspectives while incorporating the alternating and ever-changing means of photographic expression brought about through rapid digitization. Through comparing photographs for these two distinct periods, the past, present, and future image of Tokyo comes to clearly emerge and reveal itself. Featured photographers/groups include Koga, Nippon Kobo, Kineo Kuwabara, Nobuyoshi Araki, Motoyuki Daifu, Shintaro Sato, Shinya Arimoto, Natsumi Hayashi, Kenta Kobayashi and Daido Moriyama. Pre-opening reception on Wednesday, Aug. 29, from 7 to 9 p.m., featuring famous Tokyo confections, snacks, drinks and music. Hours: Monday through Friday, 10 a.m. to 7 p.m.; Saturday, 12 to 5 p.m.; closed Sundays and Labor Day (Sept. 3). Free admission. RSVPs for reception appreciated. Info: (323) 761-7510, www.jflalc.org.